STEPHEN FRY’S CAMEO on TG4′s soap opera Ros na Rún will air on BBC2 tonight as part of the actor and writer’s documentary series Planet Word. Fry travelled to Galway late last year to shoot his small speaking part, after the scriptwriters gave him cúpla focal to say. 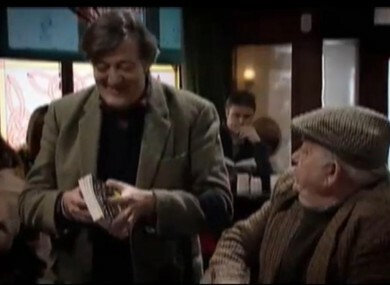 Fry plays an English tourist who ends up in Ros na Rún’s local pub Tigh Thaidhg. His lines include ‘níl ocras orm’ and ‘slán go foill’. Fry’s experience with the Irish language forms part of an episode called ‘Identity’, during which he details how Ros na Rún is attempting to keep the language alive. Email “Stephen Fry's Ros na Rún appearance to air on BBC tonight ”. Feedback on “Stephen Fry's Ros na Rún appearance to air on BBC tonight ”.